Interviews with a French monk, and a Burmese nun, who explain their choice and the conditions of an existence turned to the dhamma. dhammadāna.org investigates among people who dedicate their life to dhamma. DhammaDāna.org: Why did you take the robe? Monk Sīla Vanta: The decision doesn't lie in taking the robe. Let us simply say that it allows me to experience the life style that I find the most convenient for me. The life of the laity is very complicated. There is so much suffering from birth to death, we ceaselessly endure pains, sicknesses, old age, etc. There are so many things to tell on the subject, but mainly, being a monk enables me to set my mind free from all these things and also to perform numerous merits. By remaining a lay person, we have so many preoccupations, we have no time to fully commit ourselves to the practice of dhamma. If moreover, we have a family, we must unceasingly look after everybody. The life of the laity is too complicated. We remain in it as if locked in a jail. Buddha has found the means to get out of it; so why not trying it? After mature reflections, I have ascertained that in life, there are two possible paths: the path of money and the path of dhamma. I have chosen the path of dhamma. DD: Why did you come to Myanmar whereas we find Christian monasteries in France inside of which you can also devote yourself to meditation? MSV: The reflections I have had all along my life have always been in harmony with that which is found in Buddha's teaching. I have chosen Myanmar because I think that it is the only country where it is still possible to find auspicious conditions to a serious practice of vipassanā. Contrarily to other teachings, Buddha's one always seemed to me to be something true, which we can verify by ourselves. DD: What does differentiate the most your monastic life from your lay life? MSV: The life of a monk is much simpler, there are many less worries. Whereas the life of the laity continuously bring about money, work, family problems, etc. Whereas the life of a monk is very simple, we practise the dhamma. We do not ask for anything, we are merely self-contented with the offerings that the people want to make us, that's all. DD: Is it not too difficult, from one day to the next, to do away with the comfort of a lay life? MSV: Oh no! 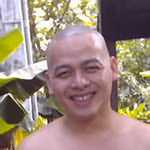 I have always dreamt to be a monk! I do not think that I will step backward. I feel very well here. I think treading the right path and I am resolved to remain on it. Truthfully speaking, I had no problem in severing myself from lay life, as despite all the comfort I enjoyed, I wasn't happy within myself. Whether being a lay man or even a monk, I feel quite indifferent to comfort. I am only after dhamma, vipassanā and wisdom. DD: Don't you miss your family and friends? MSV: Absolutely not. I don't miss my family at all. I however do not forget them, but now I must set everything aside, as I must commit myself to vipassanā. I therefore cannot allow myself to think of anybody whosoever, nor even of anything whatsoever. In this moment, I try to get out of all this (to liberate myself) . Then, when I will have the opportunity, I will help others to the best of my capabilities. Regarding friends, I don't have any and have never had any. I am therefore secure on this issue. DD: As a monk, do you believe to be useful to others? MSV: I believe to be so provided the ones listening to me trust me. That which Buddha gave to us is so precious, I would like to be able to make as many people as possible benefit from it. I will try my best to teach dhamma. I will explain others what vipassanā really is, and how we should do to liberate ourselves and to indulge in some vain recitations and beliefs. I will try to explain them in a limpid way so that they can understand. Those who do not understand, I wish that they will be able to understand one day. DD: What does please or displease in the fact to be a monk? MSV: There is nothing that displeases me, but nothing pleases me either. It is the middle path. DD: Which are, according to you, the advantages of such a life style? MSV: We enjoy more time to devote ourselves to vipassanā, and to dhamma. Whereas in lay life, the opposite thing occurs: we never have time for it. As monks, we are more likely to teach dhamma. DD: For how long do you intend experiencing a monastic life? MSV: As long as life endures! That is a certainty, as gradually, while practising vipassanā, I feel better and better with what I think. I do believe that there is nothing to do in the life of the laity, I do not believe that I will ever be able to return to it. There should occur an earthshaking change for that, but it is a pale prospect. In the lay life, there is nothing. There are only pointless distractions. Always the very same worries do occur. Sometimes, we have some amusement for one or two hours. Then, worries come back. It is always the same process. We don't have enough money, not enough of this, not enough of that. We are always intending to get more, more, more. Moreover, we never achieve the "more". DD: Did you study Buddha's teaching before coming here? MSV: No, I was brought up into a Buddhist family. I sometimes went along with them for attending a few ceremonies, but I never drew any inspiration out of it. My interest for Buddha's teaching started to simultaneously grow with the development of a few reflections I had when I was young, around the age of eleven onward. Then, little by little, it grew in importance, no desire holds attraction to me. By listening to the talks of some monks, I ascertained that their words perfectly corresponded with my ideas. For that very reason, I decided to commit myself to that path. DD: Do you succeed in observing the monastic discipline? MSV: I will try my best to observe it in the best possible way. I am very rigorous on these issues. Buddha never called whomsoever in his community. We join it because we want to. If we choose coming into it, we must observe a right conduct, we are liable to respect Buddha's word, quite simply. DD: Is this discipline not too difficult for you? MSV: I put it into practice without asking further questions. Monastic discipline is likened to traffic rules. If everybody follows them, there is no problem. The monk who does not respect the vinaya (monastic discipline) is in danger. DD: What do you do nowadays? 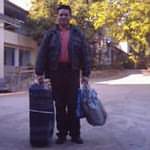 MSV: I just started a vipassanā retreat. MSV: I have no plans in mind. For the moment, I note (I turn my attention to mental and physical phenomena), that's all! (Laughters). DD: Which is your most precious aim? MSV: To free myself from all suffering. DhammaDāna.org : There is no vinaya designed for nuns (sīladhara). Nevertheless, are you liable to observe a code of discipline? Nonne Nanda Mālā : We can observe up to 8, 9 or 10 precepts, according to our choice, and it is up to the capacities or wish of each of us. The 9th of the 9 precepts, is meant for dedicating oneself to develop metta, benevolent love towards all beings, in every possible way. DD: Apart from the 8, 9 or 10 precepts, do you have other points of training? NNM: There can be others; we can, if we wish so, and according to our capacity, practise one or several dhutaṅgas. Nevertheless, we cannot practise the 13 dhutaṅgas. Owing to the fact that we are women, only half of them are accessible to us. We are not eligible for practising the others, as they pose major difficulties to a woman. Examples: susānika dhutaṅga or rukkhamūlika dhutaṅga. Regarding āraññika dhutaṅga, a nun is not authorised to dwell in a forest alone, as she would expose herself to too many dangers. On the other hand, a group of nuns is authorised to practise this dhutaṅga. 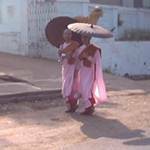 In the same way as monks (bhikkhu), nuns do not all have similar dispositions. Some dedicate themselves to the study of scriptures, others to meditation, others even, to the practice of the dhutaṅgas, each according to her skills. Some nuns only have in mind the idea to practise without respite until the stage of arahanta. Some are very skilful in pariyatti, others in paṭipatti. The ones who are very strongly inclined to paṭipatti have a natural tendency to easily observe phenomena that they do perceive. Owing to this fact, they are inclined to practise the dhutaṅgas. On the other hand, nuns who do not succeed in discriminating between perceived phenomena do not have the capacity to practise the dhutaṅgas. There are nuns who study texts, who learn excerpts from Buddha's word by heart, who are very passionate in studying dhamma. They are very fond of continuously developing kusalas. Some specific nuns train into purifying their sīla through observance of the 9 or 10 precepts, by practising the dhutaṅgas, by abstaining from consuming meat, and so on. They try, to the best of their capabilities, to gather merit. There are also nuns who, enjoying loneliness, dwell alone inside of their room. Some want to be very well versed in the knowledge of texts, some give some teachings (to nuns and laity) to make the dhamma known. I already came across nuns who practise the vinaya of the bhikkhunīs. I do have a great deal of respect for these nuns. Myself, however, I wished I could be a bhikkhunī (if such thing was still possible) and I intend, one day, to follow that discipline. In the same way, I practise the dhutaṅgas every time I have an opportunity (like the fact to restrict oneself to a single meal per day and to eat out of only one vessel). On the other hand, if I am not in a good health, I am self-contented in only observing the 8 precepts, while studying and carrying out a missionary work (to impart the knowledge of dhamma to others). DD: Are nuns sometimes going to collect their daily food among inhabited areas (the way monks do)? NNM: Yes, but not every day, as the government does allow nuns to do it only twice a week; during the two days preceding every lunar day (which exactly amounts 8 times per lunation). DD: Why are they not authorised to go collecting their food every day? NNM: Because many among them have a tendency towards greed. Owing to this fact, they would spend their whole day doing only this. They would thus no longer dedicate much time to the practice and the study of dhamma. Many nuns are women who have been married, who have experienced family life. Thus, being used to take a walk outside for long, they may easily have the tendency to spend time in making their collection. If it was so, people's devotion may rapidly fade away. That's why, following a request made by the government, the national council of the saṃgha has published an official book into which do appear all the rules that nuns are liable to observe. 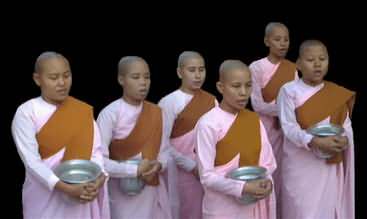 Notably, it is specified that they should go collecting their food only twice a week, and to train into the practice and the study of dhamma. DD: Why are monks, on their behalf, authorised to go daily in search of their food? Do they never display greedy attitudes? NNM: Their discipline is much stricter. Among other things, they are not authorised to cook their own meal (nor to accept money). The luckiest among them – thanks to their previous kusalas (numerous meritorious actions performed in the past), will daily benefit with a meal offered on the site. For the largest number of them, daily collection is the only means to provide for their needs. We cannot compare the life of a monk with the one of a nun. We can nevertheless compare it with the life of a fully ordained nun (bhikkhunī). The fully ordained nuns had, as the monks did, to follow a very extended kind of discipline, but that vocation got extinct so long ago from now. Soon or later, the male saṃgha will undergo the same kind of fate. Only recently did nuns swarm in large numbers. I think that for this reason too, they do not constitute a reliable vehicle for spreading (and preserving) the sāsana. That's why their status enjoys much less consideration. DD: Twice a month, monks join together to listen to the pātimokkha every lunar day, novices (sāmaṇera) take back the 10 precepts. In the same way, are nuns regularly reminded of the conduct they have to observe? NNM: Not exactly. Let us say that most of nuns back up with the lunar days while thinking within themselves: " Today, that's a lunar day, let us take benefit from such a day so as to strive for developing as much kusalas as possible ! " or " let us cultivate a pure conduct! " etc. If some nuns tend to easily develop anger, they seize this opportunity for striving to abstain from it. But all this – contrarily to what does apply to monks – is not subject to an established procedure. It is a mere outcome of the devotion of each among them. We are not liable to regularly take back our precepts. That is up to each nun to do what she deems most fit. DD: If a monk commits a pārājika, he loses his status as a monk, and if a novice transgresses one of the first five among the 10 precepts, he loses his status (until taking back his precepts). In the same way, are there not faults for which a nun loses her status? NNM: No, there is no severe restriction of this kind that does apply to nuns. Nuns' life style essentially enables them to develop some parāmīs and some kusalas by observing the 8 or 9 precepts, and to purify their conduct (sīla). DD: How to become a nun? Is will power sufficient for it? NNM: One must have the will to be a nun. One must observe at least 8 precepts. For many women who choose to become a nun, it is very difficult, because they are used to do a lot of things that they are all of a sudden liable to refrain from. For some women, it is very difficult to proceed from the observance of 5 precepts up to 10. For example, from one day to the next, they should no longer listen to music, neither watch videos, nor eat at evening time (renounce to their make up and to all their jewelleries). This existence proves to be very difficult for nuns who are but a little devoted to religious life. As many women have got attached to their head of hair, it is very hard for them to have to shave them off when they take the nun's robe. I have often met some who felt strongly nostalgic about their lay life, some often sang and they cruelly missed doing it. Nuns are liable to wake up at four o'clock in the morning (in most of nuns' convents), which creates another difficulty for some of them. Thus, many women find it hard to endure this life style. On the other hand, others, who developed more parāmīs, finds no inconvenience at all leading this kind of life.